The above info came from alessio tillema, and was edited by yours truly (contact me). The image came from Amazon.com. 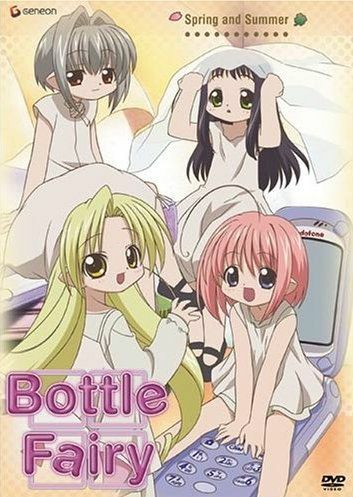 Bottle Fairy is about four little fairies, Kururu, Chiriri, Sarara, and Hororo, who want to learn about the human world. They try to learn something new everyday, trying to understand it and copying sensei-san. They live in four little bottles with four different colors: red, green, yellow, and blue. They live with sensei-san asking him what to do everyday. The above description came from alessio tillema, and was edited by yours truly (contact me).